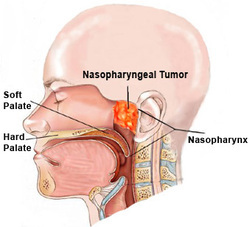 Nasopharyngeal carcinoma is a malignant and difficult to access cancer of the nasopharynx. We have treated stage III and IV of nasopharyngeal carcinoma with irradiation and local IL-2 therapy. Five years disease-free survival after irradiation only was 8%, whereas after the combination irradiation local-IL-2 therapy, it was 63%.